Fantasy Football Librarian: Media Day is here! My mom just bought a new TV for the Super Bowl, primarily because she's under the impression that she's somehow going to see me during the game. I really appreciate her enthusiasm but am trying to convince her that it's unlikely that the cameras will find me among all the many thousands of other attendees. Instead maybe I can get her in on my twitter bandwagon...but hey, you've gotta love moms. 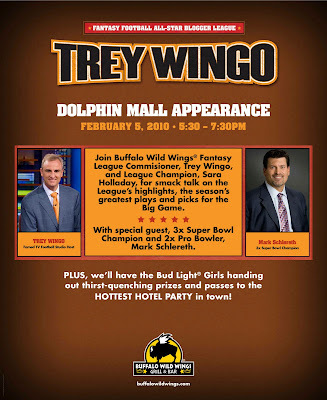 Speaking of the Super Bowl, scope out the poster for my BWW appearance on Friday with Trey Wingo and now Mark Schlereth, too. Must say I would've liked to see my face on that poster, too, but I'll take my name! If you're in the area and can come by Buffalo Wild Wings in Miami, please do! We'll be giving away prizes and passes to events over the weekend. And just a reminder that I'll be tweeting and then also blogging on the BWW All-Star Blogger website during the Super Bowl weekend and the game itself. Swing by to follow along with my crazy escapades! Meanwhile if you're wondering what's going on at the SB right here and now, well it's Media Day. One of the reasons The Hazean rocks is that he still manages to get a post up despite a major move and new job - scope out Tuesday Morning Rehab for updates on some of the latest injury news. Looking for some Super Bowl rankings? Look no further than Lester's Legends' Super Bowl XLIV Fantasy Football Rankings. Or see what CBSSports.com has to say about this weekend's players in Rating the starters: Potent Colts hold Super advantage. If you're already scratching your head wondering whether or not Adrian Peterson or Chris Johnson will get the #1 spot in this summer's drafts, then turn to Pyromaniacs.com who look at this question from just about every angle possible. Beastorbust.com has some dynasty rankings up and I've primarily focused on the QB rankings so far - two surprises for me: Brady at 10th and Cutler at 6th. Perhaps I'm just gun shy with Cutler now but there's pretty much nothing you could say to convince me to draft him next year. I know, I know, he's got Martz as his new offensive coordinator...but I'm just not buying into Cutler again. Going to the SB, and now you get Schlereth too, how sweet is that for a Bronco fan. And my Detroit Tigers just traded for his son to add some heat to their bullpen. After watching the "Changing of the hats" You Tube video with Schlereth you have to love the guy. He is funny as hell and obviously a great father!